The book chronicles Tobin’s culinary journey as told to award-winning travel writer Brian Berusch, and includes recipes from 21 Hawaii chefs, from up-and-coming talent to legends like Alan Wong, Roy Yamaguchi, and Chef Mavro. Tobin moved to Hawaii from a small farming town in Nebraska to attend college, and quickly fell in love with the people and culture, making it his home and starting a family. Presented in a unique format, the 176-page tome melds photos by Olivier Koning with correspondences from a loving son to his mother. Readers follow Tobin as he tastes his way through paradise and evolves his palate, just as a life in the restaurant world unfolds before him. Readers will experience what it means to embrace new flavors and allow them to inspire. As the story progresses, the conversation inevitably veers toward the innovative chefs who are turning the perception of “Hawaiian cuisine” on its head. Leaving “Asian fusion” fare in the dust, this new crop of globally savvy culinary talent is utilizing local ingredients to create a completely new category of Hawaiian cuisine. Tobin reflects on the ingredients and dishes that transported him from the farmlands of Nebraska to Honolulu, and Brian Berusch gets inside the kitchens (and minds) of Hawaii’s top chefs. What’s revealed in the book blends nostalgia and comfort with groundbreaking dishes—each of which is detailed in recipe format. Food To Write Home About includes a wide range of chefs from the State of Hawaii, starting with some of the most recognized forefathers of Hawaiian Regional Cuisine. Also included are a number of second and third generation chefs who trained under these notable chefs, now having branched out on their own and incorporating global practices and techniques. Some additional chefs included in the book include: Ed Kenny, Andrew Le, Lee Ann Wong, Chris Kajioka and more. 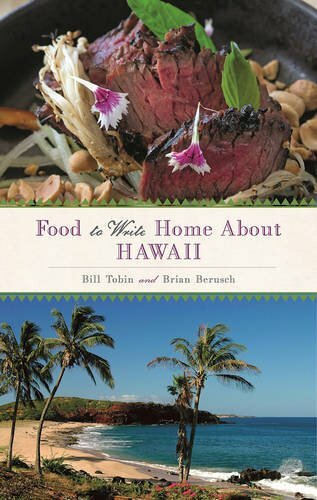 Food To Write Home About is currently available for pre-order on Amazon.com or can be purchased at Tiki’s Grill & Bar. It will be available in additional retail outlets on the island of Oahu. You can visit FoodToWriteHomeAbout.com/ to purchase as well. This entry was posted in Media and tagged billtobin, books, cuisine, tikis. Bookmark the permalink.